The Citizen Cyberscience Centre co-organized two hackfests in November, rounding off a year that has seen us run or co-organize hackfests on five continents, in places as diverse as Beijing, Rio de Janeiro and Berlin. 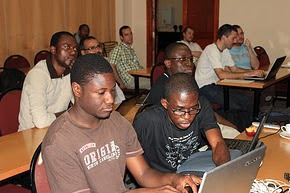 The November hackfests were in New York and Cape Town (pictured here, courtesy Daniel Lombraña González). In New York, the ecoHackNYC event was organized by Javier de la Torre and his colleagues at the company Vizzuality, and hosted in the funky surroundings of New York University's Interactive Telecommunications Programme, where artists put technology to weird and wonderful use. Groups hacked on everything from tracking the mega-carbon-footprint of the mega-rich when they fly their private jets, to tracking where toilet waste actually goes after New Yorkers flush. With colleagues from Brazil, we worked on testing Bossa, an open-source platform for volunteer thinking, which we want to use for a deforestation monitoring project called ForestWatchers (which was just selected for a grant from the Open Society Foundations). In Cape Town (actually, nearby Muizenberg), an Africa@home Data/Science Hackfest was hosted by the African Institute of Mathematical Sciences. We'd run a workshop on volunteer computing at AIMS back in 2007, which in many ways was a trigger for the creation of the Citizen Cyberscience Centre, so it was nice to come back again, and Jan Groenewald was as ever a fantastically effective and flexible host. Africa@home was co-organized with a bunch of Fellows from the Shuttleworth Foundation: Kathi Fletcher of Connexions, Mark Horner of Siyavula, Philipp Schmidt of P2PU and last but not least, Rufus Pollock of the Open Knowledge Foundation. Volunteer thinking was very much the flavour of the event, with projects on digitizing 19th century notebooks of Bushmen history, spotting potential breeding grounds for malaria in images taken by field workers and analyzing radio astronomy data in search of signals from solar flares. Rufus raised the stakes by launching pyBossa, together with Daniel Lombraña González of the CCC: it's a python-based version of the open-source Bossa platform that should make it much easier to build volunteer thinking projects. Next year, the hackfestivities continue: London, Taipei and Bangalore are on the agenda...watch this space! The Citizen Cyberscience Centre was in the news just about everywhere last week, thanks to a CERN press release that mentioned the testing of the new LHC@home 2.0 volunteer computing project. The CCC has played a crucial role in developing this project, thanks to support from the Shuttleworth Foundation. We are flabbergasted! The interest has exceeded the wildest dreams of all of us at the CCC and our CERN colleagues. And thanks to the press coverage and avid retweeting of the news, the response in terms of number of people trying to register to this new project has been phenomenal. A week ago, we reached 8000 registered users which pushed the number of computers simultaneously connected to our server well over 1000. To give a sense of scale, with just 100 simultaneous connections we had already reached the equivalent of all the computing power at CERN that the physicists who developed this project have access to. So getting more than 10x that in just a few days boggled our minds - and also bogged down our servers! We're going to open gradually to more participants in the near future. We'll then stabilize for a while before further increases. This was announced as a beta-test to explore the limitations of our system, and we certainly succeeded in doing that, thanks to the support of the volunteer community. Particular thanks to all the experienced BOINC users in the forums who have been patiently explaining to newcomers that this sort of thing is normal in a beta-test. And hats off to our technical crew (which is basically just Artem and Anton in Geneva and Daniel in Madrid) who have been working literally around the clock to get the system running smoothly again. Fun, indeed! Who knows, maybe by the time you read this blog post, the virtual atom smasher will have caught up with the data rate of it's real world cousin. Like previous hackfests in Beijing and Taipei in March, and in Rio de Janeiro in May, the objective was to spend time creating demos and prototypes that could act as catalysts for future citizen cyberscience projects. 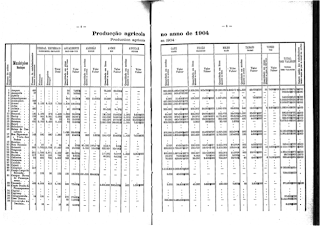 The topics tackled in B erlin ran from how to get volunteer computing programmes to run on Android mobile phones to how to digitize tables of economics data currently being scanned by the Brazilian government (an example is posted here), a project that requires volunteer help as optical character recognition programmes cannot figure out the structure of a table. 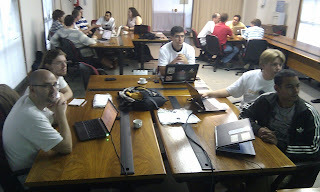 Even though this hackfest only lasted a day - previous one have stretched over two - some inspiring demos were created. Rufus Pollock, co-founder of the Open Knowledge Foundation, proving to be one of the most ardent coders. And the participants kept hacking until they were thrown out by the venue manager. Now that's dedication! We're just wrapping up the first day of the Brasil@Home hackfest in beautiful Rio de Janeiro, just a short walk from the famous Copacabana and Ipanema beaches. Amazingly, despite the proximity of sun, sea and sand, we managed to keep 16 scientists, programmers and citizen science enthusiasts cooped up in a neon-lit room for nine hours of hacking. It seems almost cruel. But we didn't have to lock the door, really! And that's just the results of day 1. We're expecting a lot more from day 2. But right now we're off for dinner...by the beach. Brasil@home - the tour begins! In a few hours, a bunch of scientists and software developers will take off from Madrid, Paris, Geneva, San Francisco and London, headed for Brazil. We're on a one-week lecture tour and hackfest extravaganza in Brasilia, Rio de Janeiro and Sao Paulo. Our objective: get more Brazilian scientists, software developers and citizens to embrace citizen-based science on the Web. If you think that sounds like a fun idea, join the tour! Today we're at the London Citizen Cyberscience workshop at UCL. We've all gathered together to discuss how best to promote collaboration on citizen cyberscience between the main London institutions and to share the experiences of those that have worked on/are working on citizen cyberscience projects. 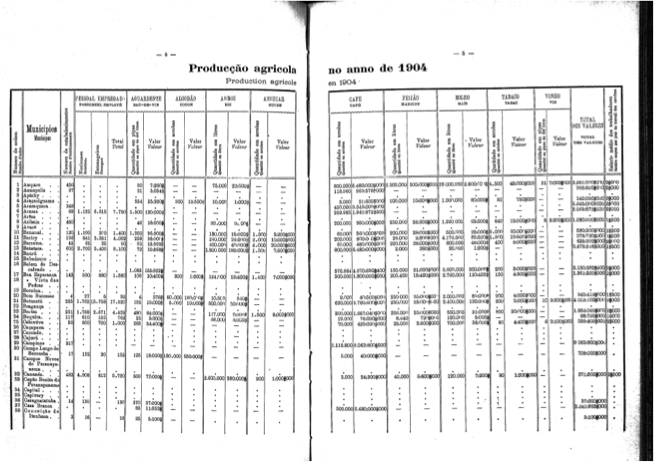 Projects such as malariacontrol.net have produced real published scientific results, which are used by governments to make important decisions. From biology to the humanities there are case studies for all types of citizen cyberscience projects. When starting up LHC@home the creators thought nobody would be interested in the project; they needn't have worried. One thousand people downloaded the application in the first 24 hours, with no publicity effort at all. In fact crowdsourcing large groups of people will often be more reliable than one expert doing all the work, as they're far less likely to make mistakes through e.g. tiredness. As long as volunteers have chosen the right settings running a cyberscience project on your computer only add on a little bit of energy. While some volunteers do just download and run applications, others post strategies onto wikis, contribute to message boards and truly engage with the problems they're helping with. Everyday more and more people are getting connected to the internet, whether by computer or mobile devices such as phones. The possibilities for citizen cyberscience are almost endless.